Christmas comes early at St Michael’s, with the opening of the Cards for Good Causes shop in the church in early November. Cards and Advent Calendars are sold on behalf of more than 35 charities, with at least 70 per cent of the proceeds going to the charities themselves. It is open until Monday December 17th, when it will be open from 12 Noon to 2pm because of a concert in the church. Then, on Advent Sunday (December 2nd in 2018), we see the opening of the first door of St Michael’s Advent Calendar which acts as the focus for our Christmas Charity Appeal, ‘opening doors for people in need’. The money raised goes to our three 2018 charities. This year it’s the children’s turn to create the 24 pictures. In alternate years they are created by members of St Michael’s Children’s Church (see detail above from Three Wise Men by Marnix van Campen-Brooks in 2016) and by local artists. You can see the Advent Calendar in the Church during the Advent season, and online. 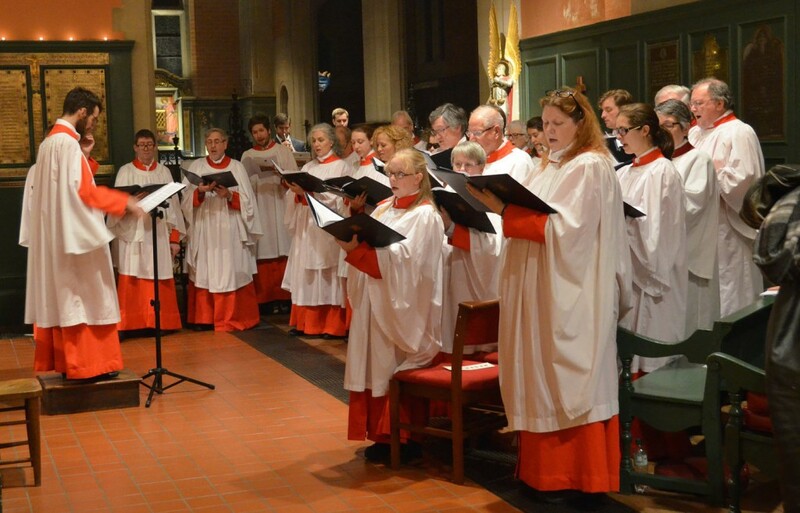 Two of the collections from our Christmas services go to the Charity Appeal, and so does the proceeds of our carol singing at Turnham Green tube station, and other events. On the evening of Advent Sunday, at 6.30pm, we have our special Advent Carol Service, a beautiful, rich and atmospheric contemplation in carols, scripture, poetry and music which reflects on the coming of Christ. At the Nine Lessons and Carols service (6.30pm, Sunday December 16th 2018), the crib figures are brought to St Michael’s Christmas Crib, which is displayed in the High Altar. They are then removed until the Children’s Crib Service on Christmas Eve. Children, in particular, love the large beautifully carved wooden figures and the excitement of “following the stars” through the church to find where the baby Jesus was born. 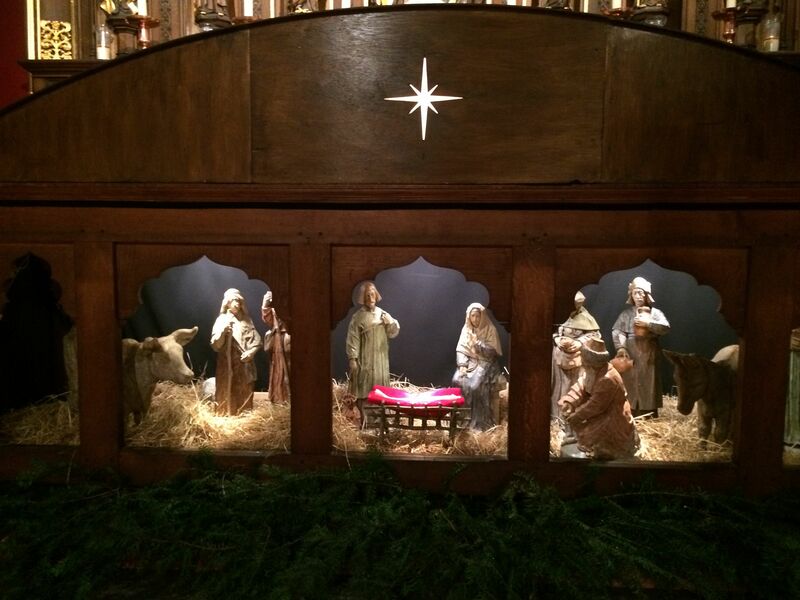 Everyone is welcome to visit the Crib before and after services – until the Three Kings arrive on Epiphany Sunday. On Christmas Eve, we have our Children’s Crib Service at 4pm, Carols at the Church Door at 10.30pm (earlier than in the past), and Midnight Mass at the new time of 11.30pm. On Christmas morning, our 10am service is a Choral Mass for all the Family. …writes Cathie James: The rich greens and reds of its interior and its atmospheric lights, reflected against gleaming brass and darkened windows echo the traditional seasonal images. The bustle of Christmas preparation is there, as everywhere – and the church is packed out for its services on Christmas Eve and Christmas Day, particularly the Children’s Crib Service (below). But there are also quiet places where it’s possible to take time out from self-focused pursuits to reflect on the true message of Christmas; to remember those who need our help and support and those for whom Christmas can be sad or lonely, particularly in these difficult economic times. Our Christmas season begins with the Festival of Nine Lessons and Carols (Sunday December 16th 2018). This candlelit service in traditional format mixes the much loved readings that tell the Christmas story with favourite carols and some fine music from the St Michael’s choir. 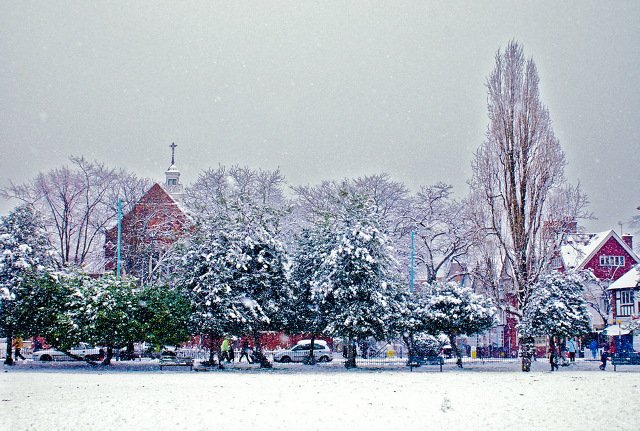 All this is then rounded off by mince pies and mulled wine. 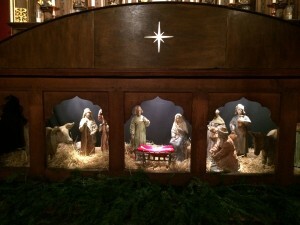 As Christmas approaches our first visitors come to the St Michael’s Crib, which is displayed in front of the High Altar until the Three Kings arrive on Epiphany Sunday. Christ’s Crib is also the central focus of the Children’s Service that is held at 4pm on Christmas Eve. 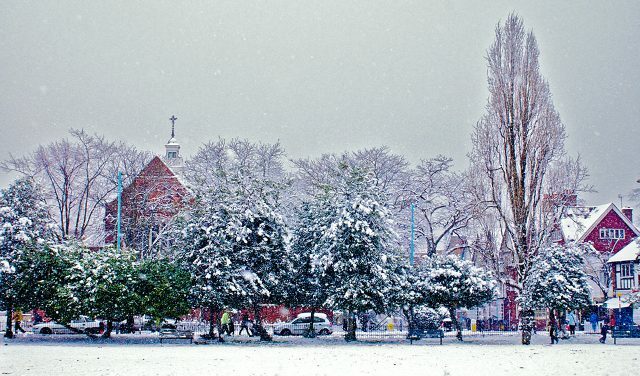 For many people in Chiswick, this is the real start of Christmas! We often have a congregation of more than 600 – including youngsters (many dressed magnificently as angels, shepherds or kings), parents, visitors and friends – as we tell the Nativity story. For the “grown ups” Christmas Eve continues with Midnight Mass, richly celebrated with words, music and ”bells and smells” in the full Anglo Catholic tradition. 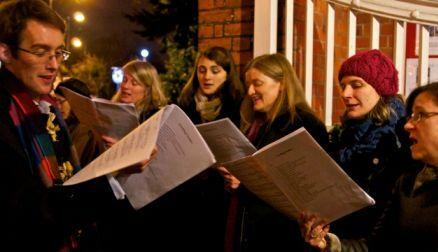 It starts at 11.30pm, preceded by Carol singing in the church porch from 10.30 p.m. (left) at which all are welcome. Our Christmas services conclude on Christmas Day with a Family Service — a chance to sing out again all those familiar tunes that are so much an essential part of the festivities—and with fun packed ‘panto’ instead of a sermon! Christmas is a time when we look forward to welcoming many new faces to St Michael’s. We warmly invite you to join our celebrations and know you’ll find at St Michael’s something special to enrich your Christmas. And with your help and generosity we can also “make a real difference” to those on whose behalf we make our annual Christmas Appeal.